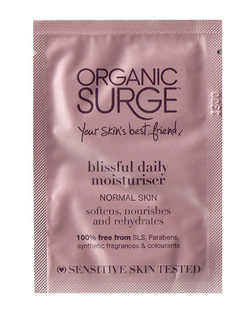 This month we are giving all customers a free Blissful Daily Moisturiser sachet by beauty brand ORGANIC SURGE. Blissful Daily Moisturiser softens, nourishes and rehydrates normal skin. The delicate formula soothes and rehydrates with a quickly-absorbed, lightweight texture. A blend of natural hydrators and antioxidants looks after skin ensuring a healthy, smooth complexion. The GMD team has tested, and we love this product because of these reasons! Dab a small amount onto the tips of your fingers and work the cream into your face in a circular motion. Use daily for optimum effect and smoother skin. Apply after cleansing with Gentle Cleansing Lotion. Posted June 13th, 2012 in Uncategorized.